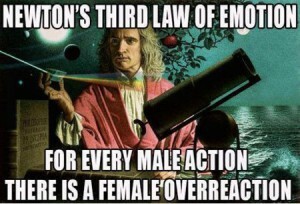 newton's three laws of motionSir Isaac Newton was born on January 4, 1643 in Woolsthorpe, Lincolnshire. When he was eighteen, he attended Cambridge University and studied physics, astronomy, mathematics, and optics. He moved away from the university when it closed due to the Great Plague, but continued his studies and published many works when he returned to school two years later. In 1667 he was appointed as a professor of mathematics and in 1672 was made a fellow of the Royal Society because of his invention of the reflecting telescope. He began his work on the composition of light in the mid-1660s and published “The Opticks” in 1704, which discussed his findings on color and light. In 1687 he published his most famous work, the “Philosophiae Naturalis Principia Mathematica,” (or “Mathematical Principals of Natural Philosophy”) which discussed gravity and the three laws of motion. 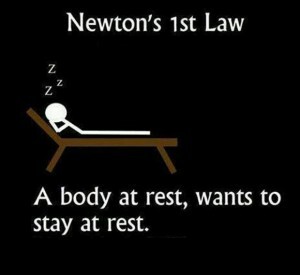 Newton’s first law of motion is sometimes referred to as the law of inertia, because inertia is the resistance of an object to change its state of rest or motion. The first law states:An object at rest stays at rest and an object in motion stays in motion with the same speed and in the same direction unless acted upon by an unbalanced force. In other words, an object will continue to do whatever it is doing unless disturbed by a driving force. Force is defined as any pull or push on an object that is the result of an interaction with another object. An example of this would be a ball rolling across the floor-it will keep going until it bumps into something or until someone picks it up. Without interruption, an object tends to continue moving in a straight line indefinitely. This is known as a uniform motion. Another example would be how an object in space will continue moving until it encounters gravity. On the opposite end of the spectrum, something that is sitting still will continue to stay still until someone or something moves it. 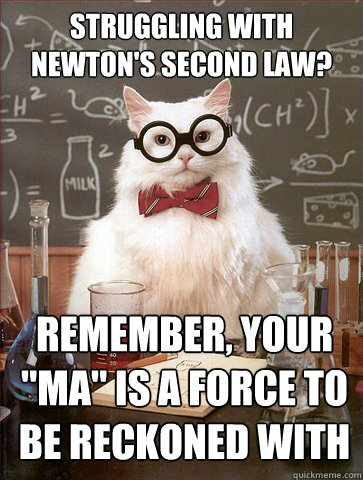 The second of Newtons three laws of motion states:The acceleration of an object as produced by a net force is directly proportional to the magnitude of the net force, in the same direction as the net force, and inversely proportional to the mass of the object. This means that the amount of force needed to move an object is dependent on the mass of the object-in other words, heavier objects require more force to be moved, and fast objects require more force to be stopped. Placing a driving force on an object will cause it to accelerate and its velocity will change depending on the direction of the force. This acceleration would be proportional to the driving force, so if you push something very hard, it will accelerate quicker. The acceleration is also proportional to the mass, which means that something with a larger mass will not accelerate as quickly as an object with a smaller mass.